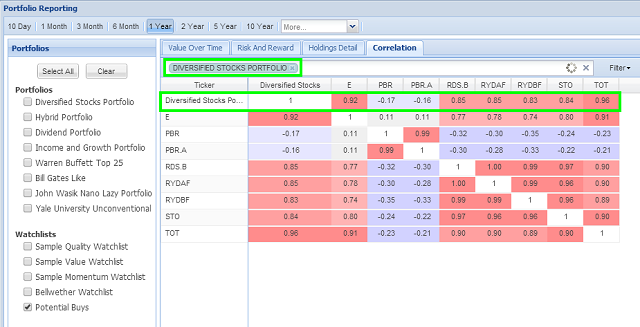 Have you explored your portfolio’s correlation profile? Knowing the correlation of your investments will help you manage the riskiness of your portfolio. If all of your assets are highly correlated, then when one of them takes a downturn, it’s likely that all of them will. 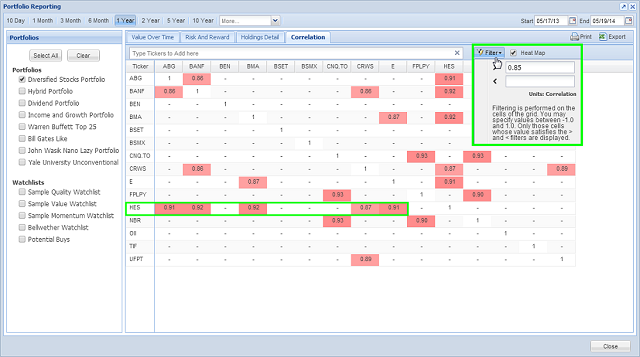 Such a vulnerability, called “diversification risk,” can be identified using the correlation matrix, found in the Correlation tab of the Portfolio Analytics window. While there are many different kinds of risk, for the purposes of this blog we’ll refer to “risk” meaning diversification risk. Before we get started, keep in mind that correlation is only one of several important factors in constructing a strong and diversified portfolio, and so should not be the only influence in deciding which stocks to buy. In this blog post we’ll explain how to make the most of this powerful feature so you can ensure your portfolios are resilient. It’s easy. How does Stock Rover calculate correlation? What’s a good amount of correlation? Correlation is a statistical relationship between asset prices. It is represented by a coefficient that measures, on a scale of -1 to 1, how likely it is that the price of two assets will move together—that is, how likely it is that they’ll both go up or that they’ll both go down. If two assets have a correlation value of 1, this means that they have perfect positive correlation—they move in the same direction (in the same proportion) 100% of the time. Perfect negative correlation has a value of -1, and it would mean that the assets move in opposite directions (in the same proportion) 100% of the time. A correlation value of 0 means that the assets move together 50% of the time. In other words, they are equally likely to move together as they are to move in opposite directions. Generally, it’s considered prudent to aim for correlation values between -0.5 and around 0.5, but more on this in the “What’s a good amount of correlation?” section below. Correlation between two assets is found using regression analysis—essentially it fits a line to a scatterplot made up of the pricing data from both assets. Stock Rover uses the standard mathematical formula for correlation, using daily dividend-adjusted price vectors. I don’t want to scare anyone off with formulas, but if you like that sort of thing, you can go here for more detail. Note that correlation is calculated over a period of time, and therefore the coefficient can change depending on the period of the calculation. Two stocks could be strongly correlated over a longer time period—say, the past 10 years, but less correlated with a shorter time period, such as the last year. 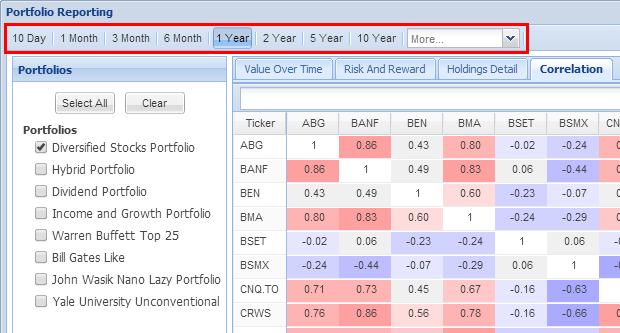 In the Portfolio Reporting facility, correlation values will be calculated over whichever time period is selected at the top (see image below). Generally, a 1-year time period works well. Quite simply, it’s a way to diversify your portfolio. A highly correlated portfolio is a riskier portfolio—it means that when one of the stocks falls, it’s likely that all of them will fall. (On the other hand, if your stocks are going up, then a highly correlated portfolio might feel pretty good!) While you can never eliminate risk completely, you can build a portfolio with a mix of assets that are less correlated, uncorrelated, or negatively correlated to reduce your volatility and potential maximum drawdown. Look at it this way: if you diversify, your return won’t be as high as your highest-returning asset, but it also won’t be as low as the lowest-returning. That depends on your tolerance of risk. If you are risk-averse, then you’d want as little correlation as possible. This is because a portfolio with highly correlated assets has the potential to experience big swings, both up and down. While finding perfectly uncorrelated stocks is pretty much impossible, you can aim to have a mix of stocks with varying correlations, so that the overall correlation of the portfolio is as low as you can make it. As a general baseline, correlations below and up to 0.7 are reasonably good, but for less risk, you may want to avoid correlations above 0.80. If you have negative correlation in your portfolio, it’s called “hedging.” Hedging can be an effective way to reduce risk. However, it can also cancel out returns in good times. The grid includes the stocks in all of your selected portfolios and watchlists (selected from the list on the left), and each item appears as both a row and a column. Any given cell includes the correlation coefficient for the assets in that cell’s row and column. If you lose track of which row and column you are looking at, you can just mouseover a cell to see that information in a tooltip, as shown below. If you see a column or row with consistently high correlation, that’s a signal that that particular asset is not helping you diversify your portfolio, in which case you should ask yourself if the returns are worth the added risk. The diagonal set of 1s are the identity cells—these cells represent the intersection of an asset with itself in the grid. The identity cells will always contain a 1 because a stock is perfectly correlated with itself. But there is more information hidden in this cell—when you mouseover it, you get a tooltip (shown below) that tells you which assets in the current grid are the most and least correlated with the identity stock. You can see that the stocks above are also shaded in varying hues of red and purple—this is called the “heat map.” Correlation above 0.5 will show in one of five shades of red—the higher the correlation, the deeper the color. Correlation below 0 will show as one of five shades of purple; deeper shades indicate more negative correlation. Grey cells indicate coefficients that fall in the sweet spot of 0 to 0.50—considered a safe zone for the risk-averse investor. The heat map is an optional setting. 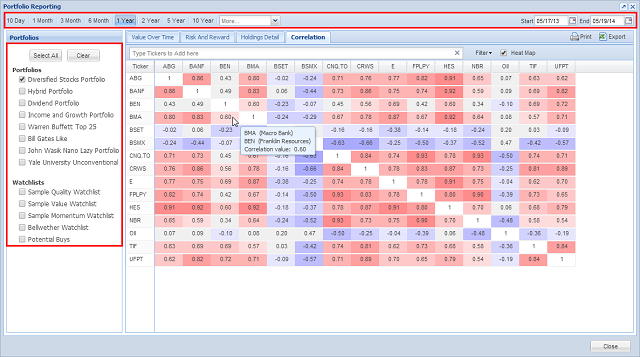 To remove the colors, uncheck the “Heat Map” box in the top right of the grid. 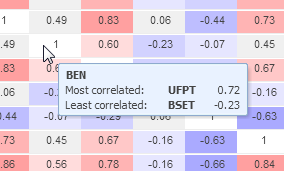 You can also filter the correlation table so it only shows you the correlation coefficients that fall within a certain value range. To do this, click on the “Filter” button and fill in the parameters. Here I’ve filtered the grid to only show correlation coefficients above 0.85. Any column or row with a lot of red still showing signals that this stock is highly correlated with my other holdings, and I may want to examine if the stock’s returns justify its place in the portfolio. For example, below you can see HES has five correlations above 0.85, so I may want to review this holding to ensure that it’s still offering enough rewards in other ways. A stock doesn’t already have to be in your portfolios or watchlists for you to see how it correlates with your holdings. Using the box at the top, you can add any stock to the correlation grid to see how it would fit in with your portfolio’s correlation mix. In the screenshot below you can see I’ve added the ticker PBR, and by looking at its row I can see how it correlates with the other stocks in my portfolio. You can add more than tickers to the matrix. Using the search box at the top, you can also add in whole benchmarks—that is, portfolios, watchlists, screeners, sectors, industries, or indices. To do this, type the name of portfolio, industry, or index, etc., in the research box, just as you would for a ticker, and select it from the results. Note: As of Stock Rover V4.4, the portfolios or watchlists selected on the left will automatically be included as benchmarks in the correlation grid, as their own row and column, so you can see how each stock correlates to its portfolio as a whole. 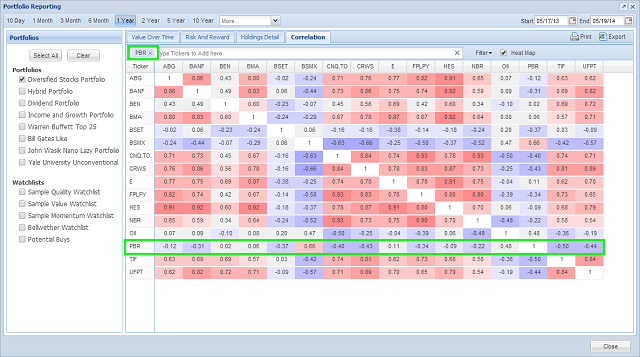 This allows you to see how a stock correlates with a relevant benchmark. 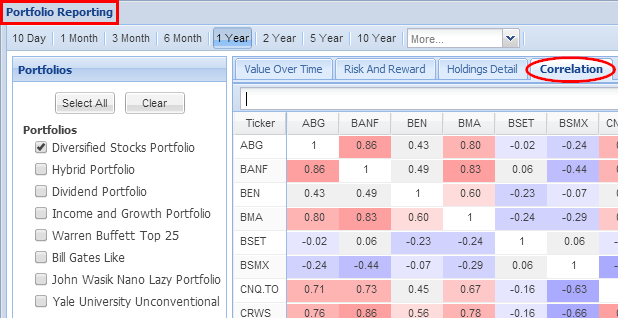 You can use this feature to see how different portfolios correlate with each other, or see how your portfolio correlates with a specific sector. Below I can see that all my portfolios have correlations above 0.85. As they are now, if one of my portfolios experiences a downturn, it’s likely that the other ones will too. Using the correlation table in this way illuminates the fact that my investments are vulnerable to diversification risk—a fact that without the correlation matrix I may only have learned the hard way. You can also use this feature to see how potential investments would contribute to your diversification. Below you can see how the tickers in my “Potential Buys” watchlist correlate with my Diversified Stocks portfolio. Note that in order to see this view I’ve unchecked everything but the watchlist on the left and typed the portfolio into the research box. While there is no precise methodology for finding low-correlation investment candidates to diversify a portfolio, you can give yourself a head start by first finding a population of stocks that has a relatively low correlation to the portfolio. For example, by viewing the correlation of whole sectors or industries to your portfolio, you may get a better idea of where to start your search. Here I’ve added in the Real Estate and Consumer Defensive sectors to the grid, and I can see that they have pretty low correlation with my portfolios, so browsing or screening for stocks in these categories may help me find stocks that would increase my diversification. Likewise, try adding your screeners to the correlation grid. Just like with sectors and industries, screeners with lower correlation to your portfolio may help you turn up stocks that can help you diversify the portfolio. If you find that one of your screeners has lower correlation to the portfolio than others, you can run that screener and use its results as a starting population. Just knowing a stock’s correlation to your other holdings is not enough. As always, further research would be needed to determine if you want to commit capital to any equity. However, as I hope you can see by now, correlation is a powerful tool for examining the diversification risk of your portfolios. Try it out on your own and see what you find.